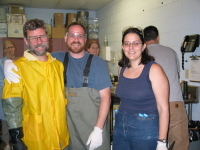 All of the following images were produced by members and affiliates of the McCormick Laboratory and may not be used or reproduced without permission. Immunohistochemistry staining for ion transporters on a seawater-acclimated salmon gill. 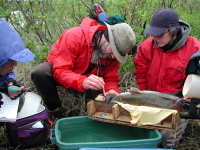 Changes in circulating hormones during smolt development. 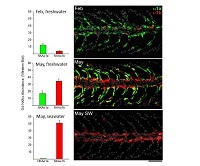 Changes in Na+,K+-ATPase isoforms during smolt development and seawater exposure. Metamorphic juvenile sea lamprey and their chloride cells (stained red with an antibody for Na+,K+-ATPase) that are responsible for the development of seawater tolerance. 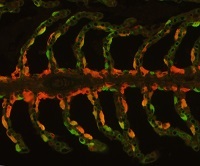 Chloride cells in the gills of the Hawaiian goby (Stenogobius hawaiiensis) stained with an antibody for Na+,K+-ATPase (green) and the apical chloride channel (red). 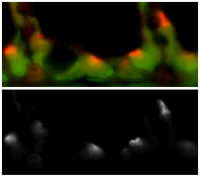 In the lower image only the apical chloride channel (white) is shown. 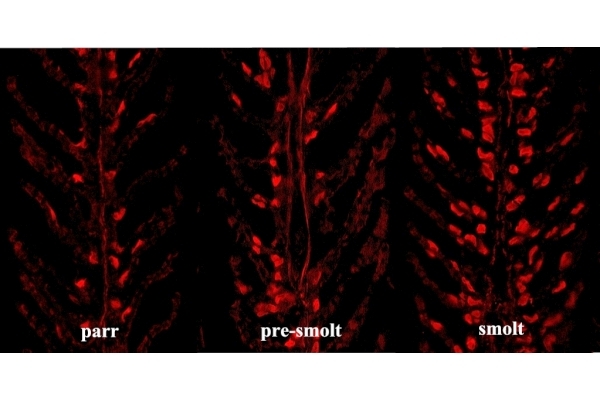 Increase in the size and number of chloride cells (stained red with an antibody for Na+,K+-ATPase) during the parr-smolt transformation of Atlantic salmon. Hormonal control of chloride cells in teleost fishes. Juvenile Atlantic salmon: the stream dwelling and territorial parr and the seaward-migrating smolt. 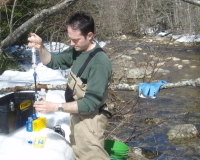 Collecting water samples to measure inorganic aluminum levels in the Swift River, NH. Setting up a cage study in a stream weir at Hubbard Brook, NH. 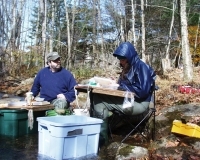 Electrofishing juvenile salmon on Salmon Brook, CT.
Getting ready for some messy sampling in the lab. 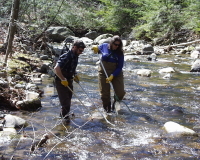 In-stream sampling in Smith Brook, VT.
Catch and release project on the Alagnak River with Julie Meka. 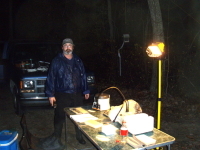 Sampling juvenile alewives at night in Brides Pond, CT.
Sampling migrating smolts in the Dennys River, ME.